￼A flight to Haiti takes just under two hours. The island is a littler further than Cuba but might as well be a continent away. We drive six hours from Port au Prince to Port-de-Paix through bustling streets and roadside markets selling fruits, meats, and household items piled on foldout tables or arranged on the ground. We see poverty, beautiful people, smiles, vibrant colors, garbage, turquoise waters, the heat, and more garbage. People sit outside houses, watching. What do they do for a living. “Nothing. There’s 95% unemployments,” says Renel (Noel, the president of Friends of Humanity). I wonder, “How do they buy food or clothes?” Some sell gasoline in plastic containers or bottled water and household supplies from stalls along the roadside. Some sell the vegetables they’ve grown. Some sell their goats. Our Jeep weaves its way through overcrowded streets. TapTaps and hordes of motorcycle taxis carry people, goats, piles of supplies, and even a donkey. The road worsens. It’s the worst road I’ve ever been on. The experience makes me smile and laugh. The motorcycle taxis traverse this road fully loaded. I wouldn’t ride it without a load. I find myself in awe of them. Women and men carry bowls of supplies balanced on their heads. Houses are mostly grew cinderblock and unfinished. They are built with poor planning, not knowing where the money will come from to finish. Rebar remains exposed, walls un-plastered, rarely painted. It can give Haiti the appearance of a construction site, or a bomb blast. Along the road a semi truck is stuck in a sinkhole and we detour through narrow, winding muddy lanes, down to a rive with hundreds of people lining the banks. We drive along the riverbed and ford the Jeep through the river waters twice. “Chevrolet” was driving us – Renel Noel, his relatives Jack and Wilna, and myself. Don’t drink the water in Haiti. There’s scant garbage collection, a paucity of electricity, poor education, and minimal healthcare. How can a country function in this manner? I have no idea but it does. It’s a testament to the Haitian spirit. They are friendly and courageous. They are a joy to be around. I feel safe and welcomed. “There’s a saying we have,” Renel tells me as we eat lunch in a stranger’s dusty front yard (who brought chairs out for us to sit on). “All is good in Haiti.” At church on Sunday they are dressed in colorful and immaculate clothes. The girls wear fancy dresses with ribbons in their hair. The young boys wear gentlemanly suits. The congregation sings with harmonies and passion. I want to bring them home to MSPC (my church). In the midst of the bustling, dusty, full-of-life town of Port-de-Paix there is an oasis. It contains a hospital, an orphanage and UNICEF tents ready to cope with cholera outbreaks. By western standards it’s rustic. It helps those most in need – children who’ve lost their parents and patients that need surgery or medical attention. The complex is the Beraca Medical Center and the House of Hope. The medical center is a hive of activity. Patients walk around outside with IV drips in their arms. There’s overground drainage and it smells of sewage in place. The sick get out of their beds and walk 300 feet in the heat to the toilet and shower outhouses. Work on a large scale is needed to provide the pure water and sanitation the facility needs. Two doctors emerge pushing a gurney through the open-air pathways and the exposed drainage channels. The gurney contains a patient, just out of surgery. On the other side of the main wall they are selling freshly chopped up goat meat covered in flies. There is one set of good, clean, western-style toilets in the center, provided by Friends of Humanity and Miami Shores Presbyterian Church. In the House of Hope babies lie on cots, some less than a year old. There are dormitories full of cots. It’s a clean and safe place. The House of Hope children come up to us with beautiful smiles and say “hello.” They want their photo taken. They offer hugs. They are pleased to see us. They are happy to be taken care of. They are the fortunate few. Doctors fly from Canada and give their time and talents to the center. 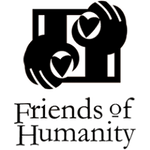 Friends of Humanity and MSPC give generously to this complex. Between us we help keep it going. Money is donated. Food and supplies are shipped. We travel to offer whatever talent it is that we have to offer. It is all needed and gratefully accepted. Life in Haiti is vibrant, beautiful, colorful, and difficult. There are no jobs. There’s no weekly income. They live from hand to mouth, from day to day, and I can’t help but think that this is faith in its purest form – survival lived out like the birds of the air. May God love and bless them all.